Pew research just compiled a huge survey of over 35,000 pollers. My take on this article: Today is a good day to be a pastor. Job security is on the rise! How much more does the great USA need Jesus now? I realize Christian leaders have given themselves black eyes ever since Jimmy Swaggart made headlines with his infamous “I have sinned” speech, only after being caught in numerous sexual scandals in the 80’s and 90’s. 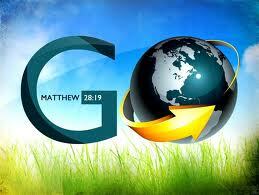 With the availability of the world wide web, our message must be the clearest Gospel ever. People need a sense a value and self worth and that is exactly what Jesus offers to the world. WASHINGTON — The United States is a significantly less Christian country than it was seven years ago. That’s the top finding — one that will ricochet through American faith, culture and politics — in the Pew Research Center’s newest report, “America’s Changing Religious Landscape,” released Tuesday. This trend “is big, it’s broad and it’s everywhere,” said Alan Cooperman, Pew’s director of religion research. 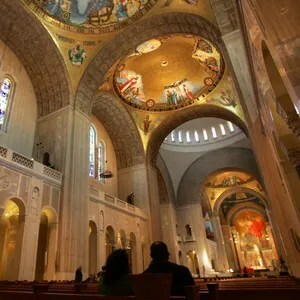 Christianity still dominates American religious identity (70%), but the survey shows dramatic shifts as more people move out the doors of denominations, shedding spiritual connections along the way. Atheists and agnostics have nearly doubled their share of the religious marketplace, and overall indifference to religion of any sort is rising as well. Only the historically black Protestant churches have held a steady grip through the years of change. Remember the familiar map of American religion? The South: A bastion of white evangelicals. The Northeast: Cradle of Catholics. The Midwest: Nest of Mainline Protestants. The West: Incubator of “nones” — people who claim no religious brand label. Well, scratch all that in the new topography. The shrinking numbers of Christians and their loss of market share is the most significant change since 2007 (when Pew did its first U.S. Religious Landscape survey) and the new, equally massive survey of 35,000 U.S. adults. The percentage of people who describe themselves as Christians fell about 8 points — from 78.4% to 70.6%. This includes people in virtually all demographic groups, whether they are “nearing retirement or just entering adulthood, married or single, living in the West or the Bible Belt,” according to the survey report. Massachusetts is down on Catholics by 10 percentage points. South Carolina is down the same degree on evangelicals. Mainline Protestants, already sliding for 40 years or more, declined all over the Midwest by 3 to 4 percentage points.The Southern Baptist Convention and the United Methodist Church, the country’s two largest Protestant denominations, are each down roughly the same 1.4 to 1.5 percentage points.Every tradition took a hit in in the West as the number of people who claim no religious brand continues to climb. Christian faiths are troubled by generational change — each successive group is less connected than their parents — and by “switching” at all ages, the report shows. While nearly 86% of Americans say they grew up as Christians, nearly one in five (19%) say they aren’t so anymore. “Overall, there are more than four former Christians for every convert to Christianity,” said Cooperman. Although evangelicals are part of the decline, their slide has been less steep. They benefit from more people joining evangelical traditions, but they’re hurt by generational change and by America’s increased diversity. According to the survey, white “born-again or evangelical” Protestants — closely watched for their political clout within the GOP — now account for 19% of American adults, down slightly from 21% in 2007. Politicians should take note, said Mike Hout, a sociologist and demographer at New York University who is also a co-director of the General Social Survey. “Traditionally, we thought religion was the mover and politics were the consequence,” he said. Today, it’s the opposite. Many of today’s formerly faithful left conservative evangelical or Catholic denominations because “they saw them align with a conservative political agenda and they don’t want to be identified with that,” Hout said. Catholics dropped both in market share and in real numbers. Despite their high retention rate for people reared in the faith, they have a low conversion rate. Today, Cooperman said, 13% of U.S. adults are former Catholics, up from 10% in 2007. Where are they going? To religious nowhere. The “nones” — Americans who are unaffiliated with brand-name religion — are the new major force in American faith. And they are more secular in outlook — and “more comfortable admitting it” than ever before, said John Green, director of the Bliss Institute of Applied Politics at the University of Akron. Their growth spans the generations, as well as racial and ethnic groups, said Green, a senior fellow in religion and American politics for the Pew Research Center. “Nones,” at 22.8% of the U.S. (up from 16% just eight years ago) run second only to evangelicals (25.4%) and ahead of Catholics (20.8%) in religious market share. Atheists rose from 1.6% to 3.1%, and agnostics from 2.4% to 4%. Combined, there are more “nones” than Evangelical Lutherans, United Methodists and Episcopalians all together. “It’s because we’re right,” crowed David Silverman, president of American Atheists. He hadn’t yet seen the Pew findings, but commented based on other surveys he said showed nones rising numbers. Indeed, it’s the public attention given to “nones” in the last decade, combined with the wide-open access to anti-religious discussion on the Internet, that drives the change, Silverman said. “More people know the facts, and more people realize they are not alone,” Silverman said. And with these shifts, the stigma of coming out as an atheist is lessening. “It’s now impossible for an atheist to think he is alone in this world. They are automatically empowered,” said Silverman. Thirty percent of all “nones” still showed “a sort of religious pulse” by saying that religion is still at least somewhat important to them, said Cooperman. However, the bulk of this group (39%) are not agnostic, atheist or vaguely spiritual — they’re just not interested. Religion is not even somewhat important to them. That same level of disinterest cuts into their social and political clout, said Hout. Intermarriage is rising with each generation. 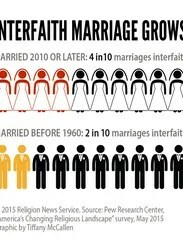 Among Americans who have gotten married since 2010, nearly four-in-ten (39%) report that they are in religiously mixed marriages, compared with 19% among those who got married before 1960, according to the report. There’s an identity gender gap. Most Christians are women (55%) and most “nones” are men (57%). However, women’s unbelief numbers are growing: nearly one in five (19%) now say they have no religious identity.Diversity makes a difference. 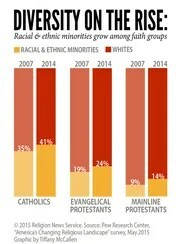 Racial and ethnic minorities now make up 41% of Catholics (up from 35% in 2007), 24% of evangelicals (up from 19%) and 14% of mainline Protestants (up from 9%). “The share of Americans who identify with non-Christian faiths also has inched up, rising 1.2 percentage points, from 4.7% in 2007 to 5.9% in 2014. Growth has been especially great among Muslims and Hindus,” the report said.